When I was working as the wine director at a NYC Italian restaurant, Paola Mustilli from the Mustilli winery came in to have me sample their wines. We already carried some and I was more than willing to try the ones she brought. After we tasted the Falanghina she handed me a book entitled “Falanghina” which included the work done by her father Leonardo Mustilli and her sister Anna Chiara Mustilli in saving the Falanghina grape. The authors are Antonella Monaco, Anna Chiara Mustilli and Luciano Pignataro. She also invited me to the winery to taste older vintages of Falanghina. The winey is about 30 miles inland from Naples. When I was in Benevento as one of the journalists at the Campania Stories tasting, I was finally able to take Paola up on her offer and went to the winery, over 10 years since our meeting in NYC. Paola, who takes care of the commercial end of the business and Anna Chiara, her sister who manages the vineyards and winemaking, greeted me. Anna Chiara said that in 1979 her father, Leonardo Mustilli bottled the first single-variety commercial Falanghina in Campania. Then there were only 75 acres; today there are over 7,000 with the majority in Sannio. Sant’Agata dei Goti is a sub-region of the DOC Sannio and they are the only winery in the area. She said they have over 20 hectares all planted with indigenous varieties. The Mustilli Family came to Sant’Agata dei Goti in the 14th century. Anna Chiara gave us a tour of the old underground cellar that the family has owned since the 17 century. In 2002 they built a new structure right outside the town. Falanghina Sannio DOC 100% Falanghina from estate vineyards, at 800 ft. located in Sant’Agata del Goti, with volcanic soil, facing southwest. The age of the vines is 10 to 30 years. Hand-harvest in mid-October. Fermented on indigenous yeast in temperature controlled stainless steel tanks. The wine is aged in tanks for 12 months. This is a fresh wine with hints of lemon and apple with good acidity. Falanghina Sannio 2002 DOC 100% Falanghina The wine was starting to show some signs of age but still was very pleasant with nice citrus fruit aromas and flavors. Greco di Santacroce 1977 I was very impressed with this wine. It was not showing any signs of age. In fact I drank as much of the wine as I could! Piedirosso Sannio DOC 100% Piedirosso from the Pozzillo vineyard, which is at 800 ft. The soil is volcanic and clay and the exposure is southwest. The wines are between 10 and 20 years old. The grapes are hand harvested in late October. Fermented on indigenous yeast in temperature controlled stainless steel tanks. The wine is aged in stainless steel tanks for 6 months. The wine has very nice fruit with hints of plums, violets and a hint of bell peppers. Greco Sannio Sant’ Agata De’ Goti DOC 100% Greco. The grapes are cultivated in the vineyards of Presta and Pozzillo in the commune of S. Agata dei Goti. The vineyard has a southwest exposure at 250 meters. Training system is guyot and there are 3,300 plants per hectare. Harvest is by hand in the middle of October. Fermentation is in stainless steel at a controlled temperature at 15C for about two weeks. Aging is in steel with periodic batonnage. The wine has hints of white peach, apricot and anise with good acidity and a touch of almonds in the finish and aftertaste. Aglianico Sannio DOC 100% Aglianico from vineyards at 800ft. with volcanic and clay soil and a southwest exposure. The vines are 30 years old. Fermented on indigenous yeast in temperature controlled stainless steel tanks. The wine is aged in French second passage barriques for 9 months and in bottle for 3 months before release. Aglianico Sanno DOC ‘Cesco di Nece’ 100% Aliganico from the “Cesco di Nece,” vineyard organically planted vineyard in 1994 and is 3 hectares. Harvest is at the end of October. Grapes are destemmed and crushed. Fermentation lasts for about 15 days in stainless steel tanks at a controlled temperature. Maturation is second passage French oak for 9 months. Lightly fined, unfiltered and a small SO2 addition before bottling. It is aged for 9 months in bottle before release. As I have mentioned before for me the best part of the trip to Campania organized by Campania Stories is the visit to the wineries. It was late afternoon when I arrived at the Di Meo Winery for my visit. Walking into the Di Meo winery was like entering an elegant home. I waited the arrival of Roberto Di Meo, co-owner of the winery with his brother Generoso, in a lovely living room with a fireplace. Fiano di Avellino 2015 DOCG 100% Fiano Vineyard is at 500 meters. Traditional wine making with controlled temperature. The wine is aged in bottle for 3 to 6 months before release. It has nice citrus fruit with hints a honey and smoke. Greco di Tufo 2015 100% Greco. Vineyards are between 400 and 600 meters. This is an ample and flavorful wine with hints of peach and almond. I was in Puglia last week with Radici del Sud 2016 for a blind wine tasting competition of Southern Italian Wine. Both the Di Meo Fiano and Greco placed number one in their categories. Fiano di Avellino 2003 “ Erminia Di Meo Selection” 100% Fiano. Roberto said that the late harvest grapes were selected from a particular family parcel. There is a prolonged maceration with the skins at a low temperature followed by soft pressing and controlled temperature fermentation. A year after the harvest the wine remains in stainless steel with the “fecce fin” for 13 more years. The next release is the 2003. This is an exceptional Fiano worth the long wait and I complement Roberto for holding it back until it is almost ready to drink. Taurasi Riserva DOCG 2007 “Selection Hamilton” 100% A Traditional red wine making. The wine spends 18 months in French barriques and Tonneau and 24 months in bottle before release. This is a well-balanced elegant wine with hints of berries, black pepper, tobacco and spice. Don Generoso Irpinia IGT 2010 made from 75% Aglianico and 25% Piedirosso and other red grapes. This is a wine with a complex bouquet with hints of red and black berries and a touch of spice. Brandy Don Vittorio aged for 25 years. I believe it is made from Fiano. Tom Maresca when he visited Roberto was luck enough to take home a bottle of this brandy and I had it with Tom after dinner on more than one occasion. Robert was surprised when I said I tasted it before. It is not imported into the US unfortunately. This is a very intense and refined brandy with hints of liquorices, honey and tobacco. There are not many winemakers that make such excellent wines that can age and also produce brandy. Federico Starnone, (aka Fred Starring on FB) saw an article I did on Southern Italian wine for i-Italy.org and posted it on FB. I thanked him and wrote that Campania Stories had invited me on a press trip to taste Campania wines and to visit the wineries. Fred suggested that I visit the Sertura Vini d’Irpinia winery because they make excellent wine. I didn’t think I could squeeze it in, but a landslide on the Amalfi Coast forced the cancellation of one of my scheduled visits, and so I was delighted to visit Sertura. Fred is the commercial representative for the winery and hopes soon to become a business partner. The owner/ enologist is Giancarlo Barbieri. Fred and Giancarlo picked me up and drove me to the winery. As always in Italy there is never enough time. So when we finally arrived at the winery there was no time to visit the vineyards, just enough time to taste the wine. Giancarlo said that in the vineyard man must follow nature with care and respect. Their new logo portrays the Clock Tower, the main symbol of Avellino, a city of which they are very proud. sAt the winery I met Giancarlo’s wife, Annalisa and his son, Alessio and we tasted the wines. We tasted five wines: Falanghina, Fiano di Avellino, Greco di Tufo, Aglianico and Taurasi, all 100% varietals. They do not blend or use international grapes. Giancarlo spoke very passionately about his vineyards and wines. Fiano di Avellino 2015 DOCG 100% Fiano di Avellino. The vineyards are in Montefalcione, a tiny village perched on a hill a short distance from Avellino. The vineyards are at 380 meters and the soil is clay. The training system is guyot and there are 4,000 plants per hectare. Harvest is by hand in early October. The grapes are soft pressed and fermented for 21 to 25 days at a controlled temperature. This is a complex full bodied wine with aromas and flavors of citrus fruit and hints of pear and green apple. Greco di Tufo 2015 DOCG 100% Greco from vineyards in Santa Paolina north of Avellino on the slopes of a hill at 400 meters. The soil is clay rich in minerals, the training system is guyot and there are 4,000 plants per hectare. Harvest is usually the first week of October. The wine is balanced with nice fruit flavors with hints of yellow fruit, pear flowers, nice minerality and a delicate almond finish. Aglianico 2013 IGT 100% Aglianico from vineyards of the small town of Torre Le Nocelle in Irpinia east of Avellino. The vineyards are at 500 meters, there is a range of temperature between night and day and this, along with the clay soil make it perfect for growing Aglianico. The training system is guyot and there are 4,00 plants per hectare. Giancarlo said Aglianico ripens late and the harvest takes place the first ten days of November. Maceration and fermentation is at a controlled temperature for 21 to 25 days. It has hints of red fruit with notes of spice. It is a big wine for an Aglianico. Taurasi 2009 DOCG The same as above only there is a selection of the grapes. The wine is aged for 18 months in various size oak barrels. This is a robust wine that will age for a long time. It has hints red and black berries, with notes of leather and spice. I was very impressed with the wine. The Sertura wines are not imported into the U.S at this time but they should be as they are excellent wines, Fred was right! They are available in Italy and a number of other foreign countries. Campania Stories is the name of an organized event to introduce and educate about the wines of Campania. 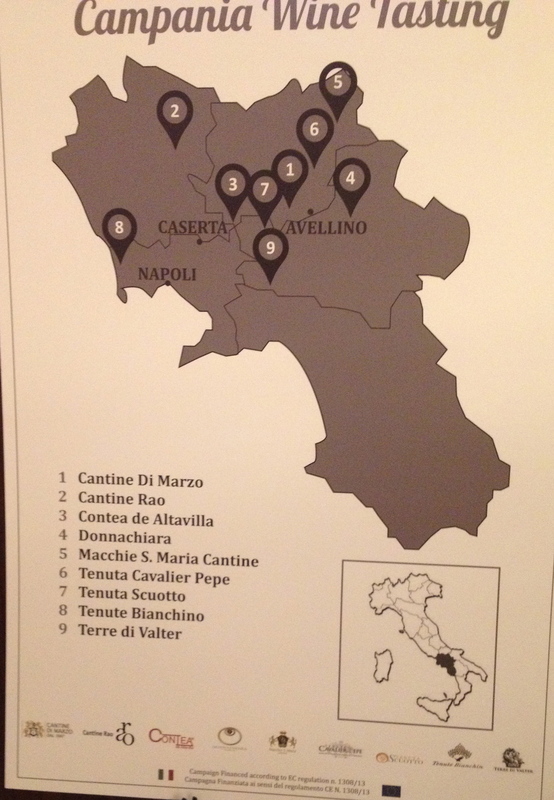 Before the trip, they sent me a list of wines that I could visit when I attended their wine event in Benevento. The first winery I chose was Donnachiara. 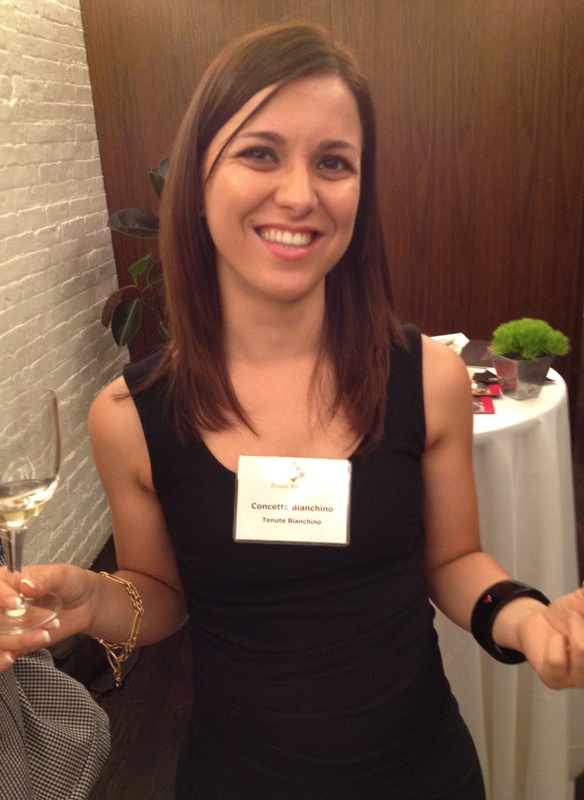 I had been to the winery before and had tasted the wines with Ilaria Petitto a number of times in NYC. I wanted to visit again to see what was new and how the wines had developed. The winery is located in Montefalcione in the province of Avellino. The modern winery was completed in 2005 but the vineyards have been in the family for 150 years. Ilaria and her mother Chiara greeted me. Chiara said that the winery is named after her grandmother Donnachiara. Winemaker Angelo Valentino led us through a tasting of the wines. I told him that the Donnachiara whites were some of the best I have tasted from this area. He said that all of them are made in the same way. The juice was free run and fermented and aged in stainless steel. Malolactic fermentation does not take place. Angelo believes that most white wines are consumed too young. He feels that they should be at least 3 years old because in the first year or so all you get are the aromas and taste of the fermentation process. 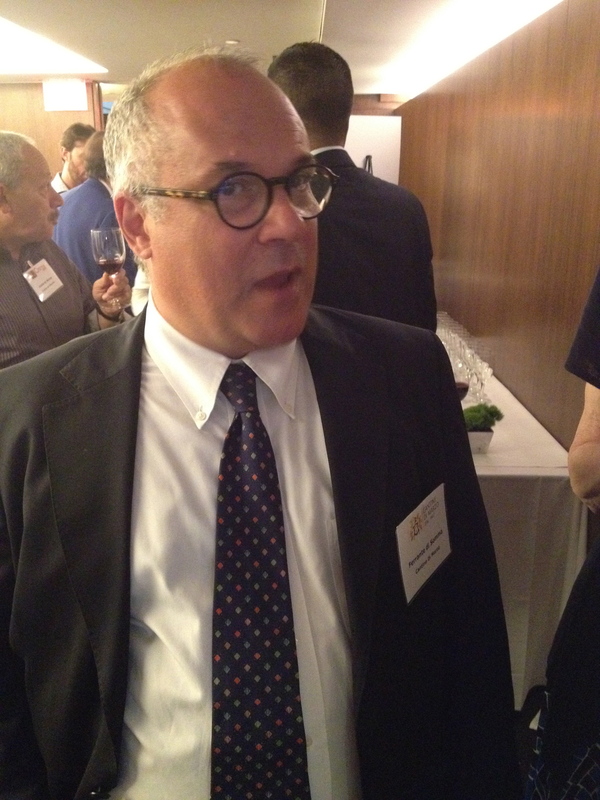 In answer to a question, Angelo said it was his love for Fiano and Taurasi that made him become an enologist. So I was looking forward to see how the wines have developed. He said 2015 was an excellent vintage. It was warm year, but rain came at the right time. Falanghina 2015 IGT made from 100% Falanghina The grapes come from vineyards that they rent in Benevento. The soil is chalky clay, there are 2,500 vines per hectare and the training system is Guyot. The grapes were picked at the height of maturity. This is the perfect wine with spaghetti alle vongole. Coda di Volpe DOC 2015 made from 100% Coda di Volpe. The wine had been bottled just 8 days before. Angelo said that this is a different variety of Coda di Volpe than is used in other areas and has more body. The soil is mostly clay and the training system is Guyot. There are 2,500 plants per hectare. This is a wine with good structure, hints of citrus and herbs. There is good acidity, nice minerality, long finish and pleasing aftertaste. We tasted the Fiano di Avelliano DOCG 2015 100% Fiano (Two days later at the blind tasting held at our hotel in Benevento. I picked this wine as one of the top Fiano’s) The soil is chalky clay and the training system is Guyot. There are 4.400 vines per hectare and the harvest takes place during the second week of October. One could see the development of the wines from the different vintages. This is a wine with good structure and body. Last time I was there I tasted the 2011, 2010 and 2009 vintages of the Fiano di Avellino. There were floral notes, aromas and flavors of citrus fruits and good acidity in the wines. There was a hint of smoke and it really become noticeable in the 2009. Angelo said Fiano grows best in clay soil. These wines are very full-bodied showing no signs of age. On this my latest visit, I tasted the 2009 and the 2007. Both were showing very well and still showing no signs of age. The 2009 still had that hint of smoke. Angelo said that it was colder in 2009 than in 2007 so the wines did taste slightly different. I drank both of them with a traditional lunch of Ravioli, Meatballs, and la Pastiera, the traditional Easter cake prepared by Chiara. Umberto Petitto, Chiara’s husband, joined us for lunch. Greco di Tufo 2015 DOCG 100% Greco di Tufo The soil is tuffaceious and the training system is espallier. There are 3,300 plants per hectare and the harvest takes place during the second week of October. Illaria said that the grapes come from highly rated vineyards. The grapes are not destemmed or crushed prior to pressing. Cold fermentation with extended maceration. No oak is used. This is a wine that needs at least 5 or 6 years of bottle age before it is ready to drink. One of my top picks at the blind tasting. When I visited the winery 3 years ago, I tasted barrel samples of two wines, Greco 2011 and Fiano 2011 both of which they made for the first time. Fiano 2011 IGT only made in the best vintages with no battonage, like in Alsace with 20% new oak and late harvest grapes picked when there was sleet in November. It is a dry wine. Ilaria said that her father Umberto had planted the Greco di Tufo grape in Torre le Nocella, which is not in the DOCG zone. He felt that this area would produce a Greco of great quality. It is a single vineyard (cru) Vigna Nascosta, which means hidden vineyard. The Fiano is a cru from a single vineyard in Montefalcione and will be called Esoterico. Angelo explained that both these wines would be different from their other white wines. Both will be fermented and aged in new barriques. I was pleasantly surprised at how well both these wines had developed. The Fiano was elegant and complex with hints of citrus fruits, especially lemon, with a touch of smoke. 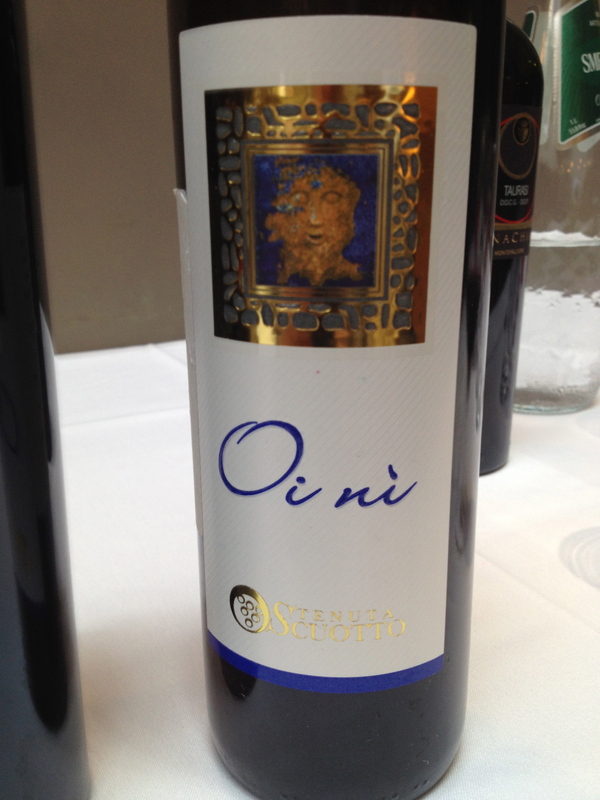 The Greco was complex and rich with hints of apricot, mango, candied citrus fruits and good minerality. I then had a discussion with Angelo about which wine ages better, Fiano or Greco. We disagreed. He stated the case for Fiano and I for Greco. Taurasi di Umberto 2012 named after Umberto Petitto. 100% Agalianco, The soil is clay and the training system is Guyot, there are 4,000 plants per hectare and the harvest is the first week of November. The wine spends 18 months in French barriques. Taurasi Riserva 2012 DOCG The wine is like the one above but is aged in very old barriques. It is a big tannic. intense wine with good structure and body and hints of blackberry, plum, cherry and a touch of coffee. It will only get better with time. We also tasted the 2009 and 2011 Taurasi which were developing very nicely. As I have often stated, some of the best white wines in Southern Italy as from the region of Campania. There are many styles of white wine made from a number of grape varieties, Which were Introduced by the ancient Greeks who settled there. Some of These wines can be drunk young and others can age for many years. One of my favorite restaurants in NYC is Il Gattopardo, owned by Gianfranco Sorrentino. The restaurant specializes in Neapolitan cooking. I can not think of a better place to enjoy a Campania Wine Tasting than there. 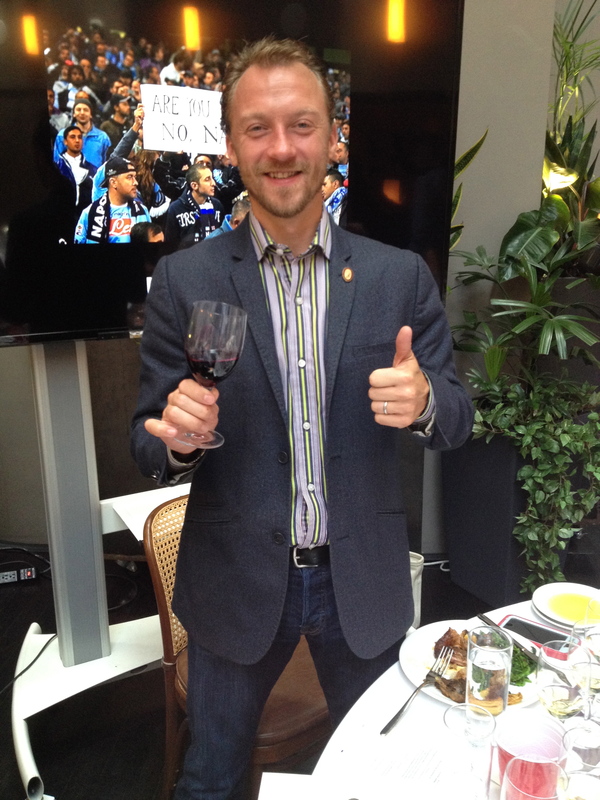 The tasting was presented by Master Sommelier Fred Dexheimer, who delivered an excellent presentation. There were nine wines – five whites and four reds. Here are the 5 white wines and the foods they were paired with. I will write about the red wines and the foods paired with them another time. 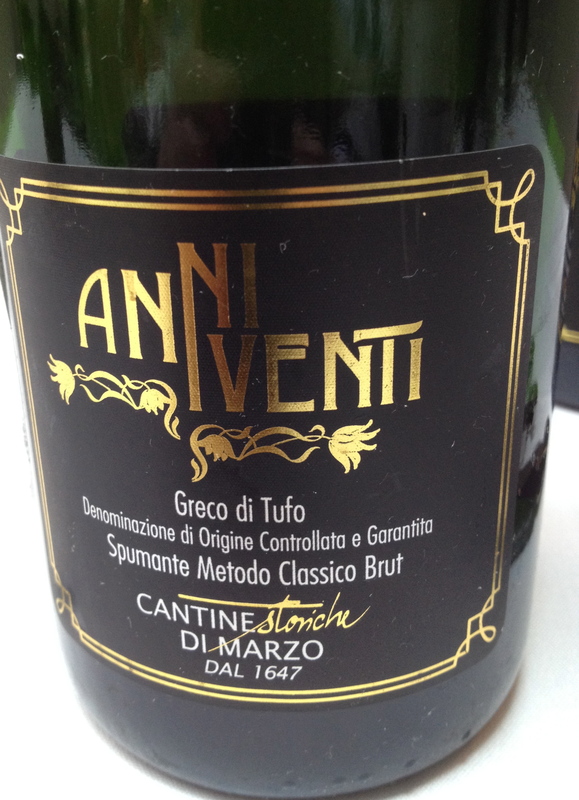 Anni Vent di Tufo DOCG Spumante NV Cantina Di Marzo 100% Greek di Tufo Brut Methode Classic. The vineyards are at 350 and 500 meters and the exposure is south. The soil is clay and limestone and the training method is Guyot. There are 3,000 plants per hectare and the average age of the vines is 5 to 20 years. Harvest is by hand in October. Both alcohol and Malolactic fermentation is in stainless steel. The wine remains on the lees in the bottle for 36 months. It has fine and persistent bubbles with hints of dried fruits and a touch of bitter orange and almonds in the finish and after taste. Ferrante di Somma representing the winery said that he is a direct descendant of March Scipio who founded the winery in 1647 making it one of Italy’s oldest wineries. He added anche That Scipio was the creator of the Greek di Tufo variety. 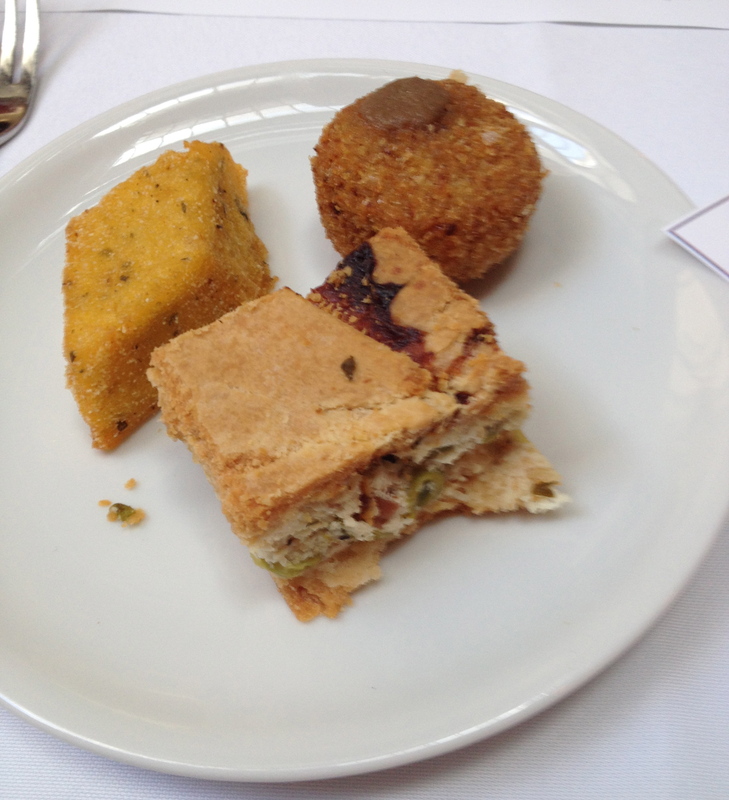 This was served well with the Nibbles: Scagliozzi of Polenta, mini mozzarelle in carrozza con’saletta d’acciughe and Assagini di torta”Pasqualina” – polenta croutons, toasted miniature mozzarella sandwiches with a light anchovy sauce and bites of vegetable and cheese tart. 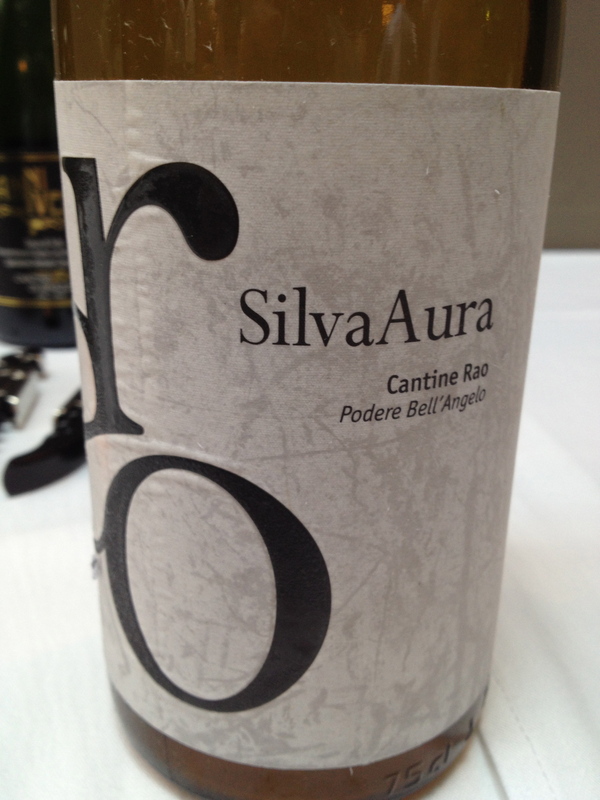 Silva Aura Pallagrello Bianco Terre del Volturno PGI 2013 Cantine Rao. Made from 85% and 15% Pallagrello Fiano. The age of the vineyard is 30 years and the exposure is southeast and they are at 200 meters. There are 4,500 vines per hectare and the training system is Guyot and the soil is loamy sand. Harvest takes place the first week of September. Representing the winey was Francesco Reo. 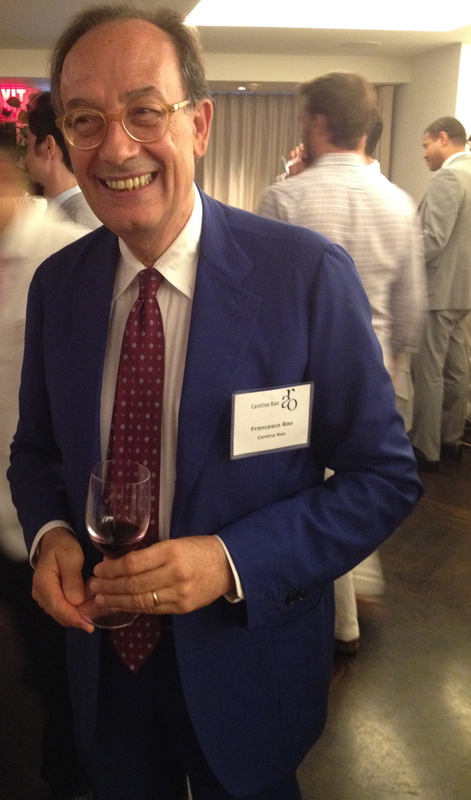 Dr. Reo Said that the winery is in the heart of Campania. He Said That the Pallagrello grape became almost extinct but there was a revival in the 1990 “s. The wine is fermented and aged in stainless steel at a controlled temperature. It is aged in steel tanks for 4 months and in bottle for two months before release. It has hints of peach, apricot, apple and pears. 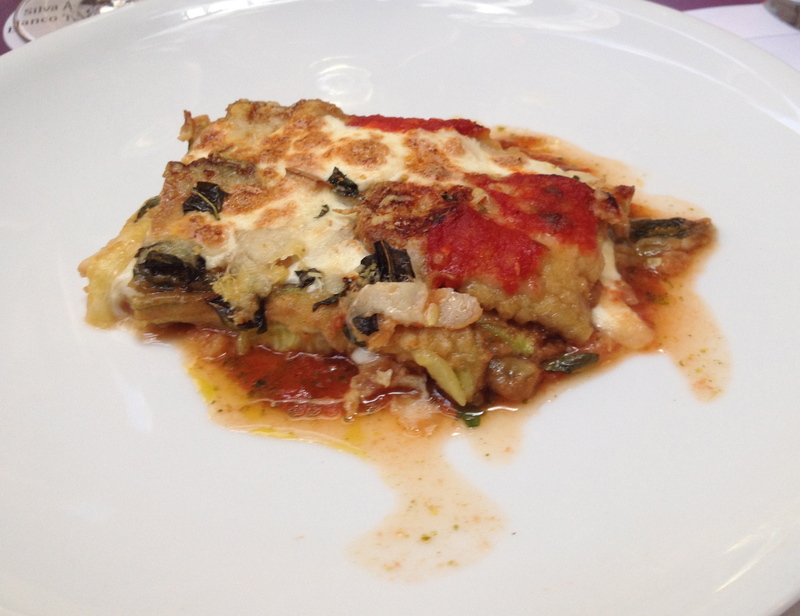 This and the next 3 white wines were served with the Parmigiana di zucchine con scamorza e salsa al pomodoro – zucchini parmesan with smoked mozzarella and tomato sauce. Or Ni Campania Fiano DOCG 2011 Tenuta Scuotto 100% Fiano di Avellino. The vineyards are at 480 meters and the training system is Guyot. Harvest takes place the first week of November. There is a soft pressing of the grapes and temperature controlled fermentation with indigenous yeast in oval barrels. The wine is aged for 12 months on the lees and 6 months in bottle before release. This is a full-bodied and elegant white wine with hints of apricot, pineapple and a touch of hazelnuts. 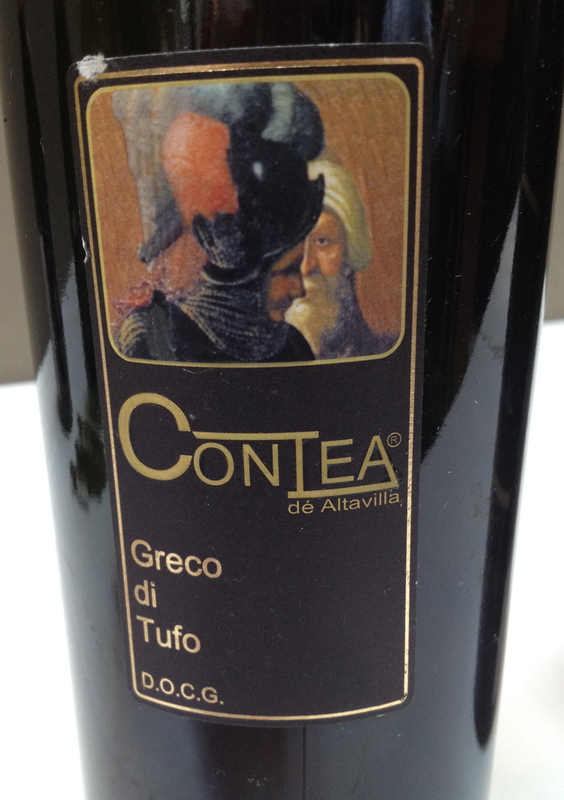 Greco di Tufo DOCG 2013 Contea de Altavilla 100% Greek di Tufo. The soil is clayey and calcareous. Harvest takes place the second half of October. Fermentation is in temperature controlled stainless steel tanks and the wine is aged for 5 months in stainless steel tanks. This is an elegant wine with hints of apricot, peach, pear and a touch of bitter almond in the aftertaste. La TreRose di Giò, Falanghina IGT 2014, Tenute Bianchino ( 100% Falanghina.The vineyard is situated between the cities of Falciano del Massico and Mondragone.The training system is espalier (vines trained along a wall fence or trellis). 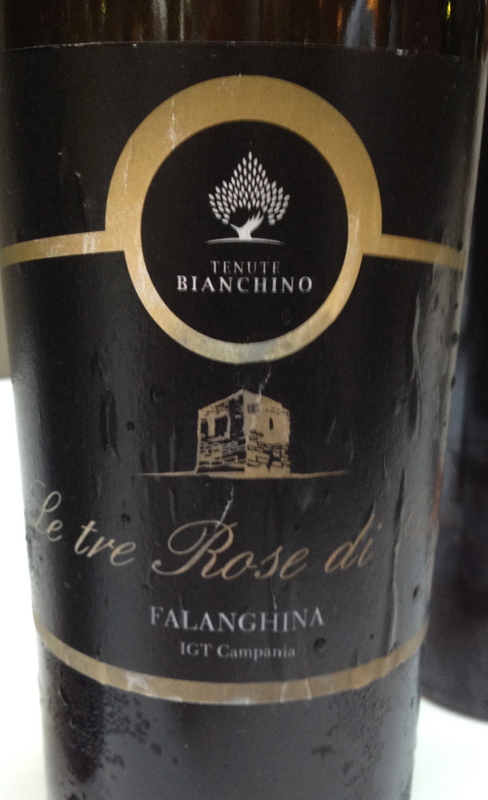 Concetta Bianchini, representing the winery, said That Falanghina has a leaf cuneiform (wedge shape with a tapered end), is a medium sized grape bunches and conical with a thick and compact skin. Harvest takes place at the end of September and first week of October. Vinification is in stainless steel and before the wine is released it remains in the bottle for one month. This is a balanced wine with hints of fresh citrus fruits, green plum, a long finish and very pleasant aftertaste. The Falanghina should have been served before the Greco and Fiano, which are more substantial. However, all of the wines matched well with the food.